I don't like the end. Left us without knowing what next? 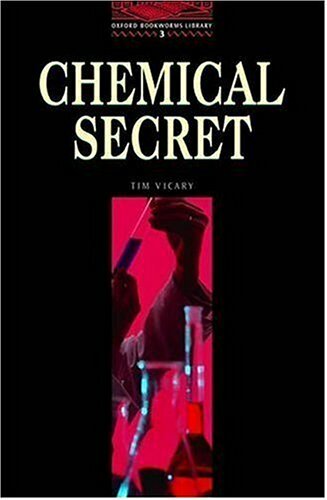 I read the book Chemical Secret by Tim Vicary. It's about a man, John, who's rich at first, but then his wife dies and he's really sad and unemployed. But he has two kids, and he got to take care of them. So he sollicitated for a job, and he got in! But there was something wrong, very wrong, that brought his daughter in danger. I don't like the open ending, it makes me consider a lot of options. I was thinking that de baby has 4 legs, or that it has not a heart or something, but maybe she's mentaly disabled or there is nothing wrong. I also think she might have the down syndrome when she's born. I admire how John Duncan earns money for his kids and how he goes on with his life. John is obviously a good man. I thougt it was a very stupid book because it took me a long time to read it. The story wasn't intresting to me. It's about an old man named Jonh with his creepy story about a building with toxic chemicals. The old man lives alone in his house, with his two children, since his wife died a while ago. He goes and works at the factory because he wants to buy a better house for him and his childeren. In that factory they make new car paint, and he has to go and test if they're dangerous. Later on he realizes the chemicals in the paint are very toxic, and that there are more bad aspects to it than just intoxicating the enviorment. Because of the simple fact that these kinds of stories don't appeal to me, i wouldn't reccomend it to anyone who doesn't like either thrillers or adventurous books. Since it's an easy book, i would reccomend it to people who are just starting at reading English books. Because of the fact that the reading level of the book is so low, you do have to understand that it is quite monotone and that can come over as quite boring. What do I do when I get involved in such situation like that? If I was John Duncan, did I tell everybody that the waste product is dangerous or I cover the truth to keep my job. Money doesn't make people happy. If I don't have freedom the I am just slave of money. I think the writer used simple words or words I already know, so it was not too difficult for me to read. The main character, John, was a chemist and works for a painting factory. He knew they flows the dangerous chemical into the river- he saw rats babies with no legs, no arms, or two heads, but he could do anything about that - he suggested his boss to put a machine for clean the chemical water, but his boss disagreed it and threated him to fire him. Ironically his pregnant daughter was almost drown by the river so he had to admit it. Now I think I enjoy reading itself in English without a dictionary. So plots are no so important, I think. So this book is not so bad. The book is telling a story about a father who is urgently looking for a job in order to be able to give his children what they need. For ex: a good place to call home or money for school and school trips. As it is urgent, the employers abuse the situation. They know that he wants to do everything what they ask. The employers start to abuse the situation more and more during progress of the story. At a certain moment, the father can’t refuse as he is already too deep into trouble and can’t afford to be honest. His children really need a warm and clean place to stay and good food. He can’t afford to lose that again. That’s why he is listening to them in the first place. I like the book ( the story) as it is reading smoothly. When you start reading again after a while, you are immediately back into the story. A lot of drawings in the book give you an insight of how the situation is and how everything looks like. The story is well written and not very difficult. I can recommend the book, if you like reading in English of course. 1: Oxford Level 32: 7/14=85 minutes3: new life, paint company, rich, environmental problems, seals, marry, articles4: a) "I haven't been always happy. People used to say I was very unlucky man." b) These sentences are very ambiguous. First, John was very poor and unhappy man. He and his children lived little house. But one day he got a new job. He became a rich man. They could live big house and John looked like very happy man. However, he knew about chemical secrets. This chemical could kill many animals. First, John tried to solve these problems but his boss said keep the secret or he lost his job. John couldn't solve these problems and worried about it. This concern changed his life and mind. After 18 months, John's daughter Cristina married Simon. He is journalist and was trying to expose chemical secrets. John worried about more and more. In wedding ceremony, John met Simon's parents and said this sentences. I can feel his concern and pain.5: This story contained many important things. "Can money make people happy?" This thought is also written in this story. If we get money, we become happy. But is it true happiness? At first, John was very poor and lived in very small house. However, they looked happy. After he got much money, they could spend rich life. Instead of this life, they lost true happiness. Their relationship became worse and worse. Finally, John lost everything. Of course, money can change our life dramatically but we shouldn't forget we lost true happiness if we got much money. Oxford university press Level threeThe book summary this book is about sad story. The main character, who is John, is a scientist in a company. He checked the chemical product which was produced by paint was safe or not. The company throw out chemical product into a river. He tested the product. How to check it is that he gave the products rats, rats ate and drank it. The result of it was awful. The rat gave birth a baby, and the baby had no eyes and legs or had six legs. It was also dangerous for people. So John suggested a company should make a machine to clean the products. But this machine was too expensive to be made, so the company did not agree the suggestion and they did not make it. One day John's daughter fell into the river, and drown. Actually she was a pregnant, and she drunk a lot of river's water. Finally she gave the baby, and the baby had no.........The final scene was not written, so readers have to imagine the baby is strange or not. I guess the baby has no eyes or no legs. The some strange things must be happened to the baby. I learned the chemical has a lot of influences towards any animals. Es la historia de John Duncan, un biólogo de avanzada edad con doshijos que no conseguía trabajo. Finalmente encuentra uno en un fabricade pintura, el trabajo es perfecto, hasta que un día descubre que losdesechos de la fabrica que van a parar al rio son demasiado dañinos ya partir de ese momento suceden una serie de cosas que terminan porprobar su honestidad.En Fin, el librito fue muy bueno pues es un situación en la que todosnos encontramos en algún momento, y la verdad si no hubiera sido asíno creo que lo hubiera terminado.La verdad fue una experiencia diferente leer un libro en ingles y meencanto….solo que es algo tedioso porque quiero entender palabra porpalabra y aunque entienda la idea general, si hay una palabra que noentiendo me distraigo para buscarla en el diccionario y eso es lo queno me agrada jijii pero bueno así aprenderé…. 'chemical secret' was shork to me. Because the factory of owner was very very terrible. The hero's name was 'Ducan'. Mr.Ducan was fool. so he needs job. Fortunately, He can enter the some paint factory. But the factory was not honest company. They gave car,house and high salary. But they did big crime. They throw the paint into the water source. So a lots of fishes died because the paint. They said just a little of paint, but even a little of paint, it can be make many fishes die. And some of people can eat and drink polluted fishes or water. When evryone knows their crime, they got interview. The factory of owner let to Mr,Ducan for interview. The factory of owner said 'If you say true, you will lost your job.' Mr.Ducan worried about lost his job, but he was honest. I thought for this book Mr.Ducan was very brave and honest. This is a short book that you might want to read during your free time!John Duncan got a job in a company that makes paint.The chairman of this company is David Wilson, and he is a selfish business man.John and his kids were living in poverty after his wife had died, so this new job was an opportunity to start a new life for them.The company became very successful and John made a lot of money.However, he finds out that the chemicals that the company uses to make paints are very toxic, and it can even kill someone.John was threatened to keep this as a secret - or else he will be fired.Then something irrevocable happens.If you are eager to know what happens next, read this book!! - OXFORD UNIVERSITY PRESS- Time: 11/11= 75 minutes- 7 word summary = honest, scientist, need , money , hide , bad , dauter- Discussion Question- 1. If you found the injustice of the company, what would you do?- A. I would say the truth because we should not admit it.- 2. Do you think making money is the most important thing?- A. That's a difficult question. Actually, making money isvery important. But I think there are more important things. This is a very sad story. I felt sorry with John Duncan. He became a poor, so he want his family to spend happier. But he overlooked an important things. I wish his dauter's child was born with nothing happened. This book is the sad story. The main character in this book was John Duncan. John Duncan was a very poor man he live with his daughter and son since his wife has pass away. His life change when he got the new job. But then John realized that the factory of this chemical was produce chemical in to the water which this cause the water pollution. One day Simon and John daughter when to see the water pipe close to the factory to look what cause it. But then Christine fall out of the ship and drank a lot of polluted water. 1. Oxford University Press, stage 32. 7/1= 50 minutes, 7/2= 70 minutes 3. an honest man, his daughter, poison, downstream, drowning, enquiry, lost a job4a. He picked it up again, and rang the number. Seven . . . five . . . eight . . . three . . .it was no good. He put the phone down again. He could not hear the news from the cold voice of a nurse over the telephone.4b. I like this description because he didn't tell a lie and very worry about her daughter's baby.5. I impressed John because he told honestly even he was fire. -Oxford level 3-Time 10/20 40minites 10/21 30minutes-7-word summary story-of-bad-chemicals-spoil-earth-environment-Discussion questions1. Have you ever considered environment?A. Yes, I have. I often try to separate trash well.2. If you are a office worker relatedto environment, which do you choose money or environment?A. Of course, I choose environment. If we do not care environment, the earth will be terrible.I think that this book is good to understand environment. We must clean the earth. The Oxford Bookwarms Library: Stage310/11=60,10/13=45,10/14=607-word summary: chemical-paint-poison-job-honest-late-aloneDiscussion Questions1. Are you honest? If not, do you want to be honest? Actually, I'm not honest. I almost always tell lies!!2. Are you interested in chemical? I like chemical things. They are useful and helpful for our lives. But somtimes they could be・・・,you know. 1.Tim Vicary, oxford, level32.95minutes3.working dauther chemical money father rich poor4. a: The hero can't say "no", so he did many things that is not kind for environmental in this book. b:I don't like this book because there isn't any happy description. I also learned about the fear of the chemical pollution.5. I learned that we should say "no" if we may not want to do something and we should think about humean life to the first. 1.Tim Vicary,Oxford,Level 32.90min3.new,working,home,died,seals,factor,report4.What do you know about the chemical environmental destruction? -I know Minamata disease.Minamata disease is a neurological disease caused by mercury poisoning.5.I have not finished to read this book yet. There are many difficult words for me in this book. But this story is very interesting! When I finish to read this book,I post my reviw again. Please look forward to my review. -OXFORD UNIVERSITY PRESS ,level 3-Time; October 6th=70minutes-7word summary-job-problem-John-honest-cannot-money-poison- Discussion questions 1.Do you want to make money without being honest？No,I don't. I want to earn money because of my pleasant job.2.Do you want to see your future if you can see that？No, I want to make my future by myself！This story is a little serious, but it will be able to get some information. -OXFORD, level 3.-Time: 10/1 = 40 minutes; 10/3 = 60 minutes.-7-word summary: biologist - factory - chemical - paint - river - money - animal-Discussion questions:1. If your company do something wrong, can you denounce? I want to denounce, but I will be afraid of losing my job.2. Do you think animal experiments are necessary? It's necessary for safety of human, but we have to keep experiments to a minimum. *OXFORD level3*12/9=90min*7words summary scirntist/family/job/factory/river/pollution/worry*discussion question 1)Do you have dirty river near your house? ...Yes. There is s drain next to my house. It is not clean. 2)Have your relatives or you got illness because of environmental pollution? ...I don't know that allergic rhinitis is caused by environmenal pollution, but I have suffered from allergic rhinitis since I was an elementary student. Oxford University Press, Level 3Time to Read - 75min.7 words summary - scientist/experiment/money/daughter/fall into/river/pollutionDiscussion1. Which is better that you do not eat any sea products because you worry about getting polluted products into you bodies or trust the government and producers and eat your dishes which have probable polluted? Definitely something that makes people realize that even "a little" of waste could affect the environment so greatly. Interesting book, but it could do with a lot more detail and a better ending that isn't so abrupt. Tim Vicary Jennifer Bassett Tricia Hedge - Tim Vicary is an author and a recently retired university teacher from the university of York, England. His legal thrillers about a tough British barrister, Sarah Newby, have been compared to the works of John Grisham and Scott Turow. The second book in the series, A Fatal Verdict, was awarded a B.R.A.G Medallion for an outstanding independent novel, and the third book, Bold Counsel, was awarded the Awesome Indies Seal of Excellence. He is currently writing a fourth book in the series, entitled Broken Alibi.His four historical novels have also won praise. Nobody's Slave, a novel about the Elizabethan slave trade, won first prize in the young adult category of the Kindle Book awards 2014. His three other historical novels, Cat & Mouse, The Blood Upon the Rose, and The Monmouth Summer, are all available individually or as a boxed set of three, entitled Women of Courage.Tim has also written about twenty much shorter books, graded readers for foreign learners of English, published by Oxford University Press. In 2010 and 2011 two of these - Titanic and The Everest Story - were each the winners in their category for the Language Learner Literature Award for the Extensive Reading Foundation.Tim lives in the English countryside, near York. When he's not writing he likes horse-riding, cycling, and swimming.